MyWallet helps you to keep under control expenses and banking accounts. 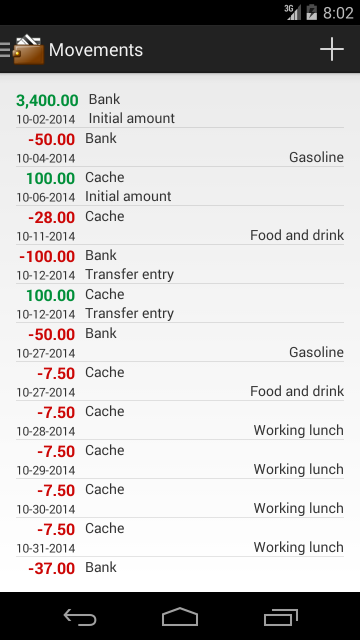 MyWallet is a practical application that allows you to manage your money. You can define how many accounts you want for keep under control for example the bank account, the cash money in your wallet, the credit card and so on. You can define a lot of categories of spending, of accredit and of transfer from an account to another. This allow you to see where you expend your money: in food, drinking, transport, clothing, health, and all you want. The application registers any money movement: when you pay, when you take your salary, when you transfer from an account to another such as when you take money from your bank account with the ATM to move it in your wallet or in you recargable credit card, etc. 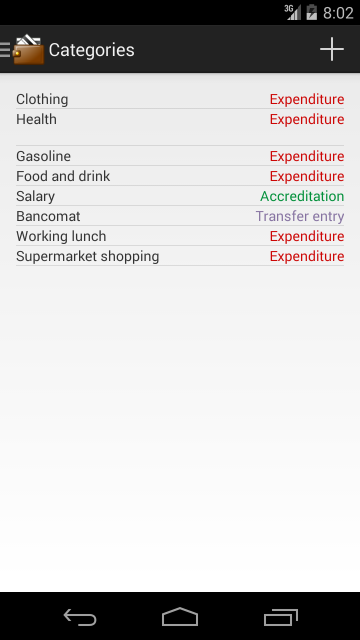 In the main screen of the application you can keep under control what is your disponibility in each account you defined and the total amount of expenses of the current month divided by category. 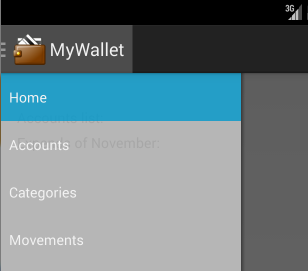 MyWallet works with several archives where to store all kind of information needed to better manage your money. The program comes with all archives empty. The user have to compile this archives basing on his needs. To view or modify an archive, open the Navigation Drawer by clicking the top left corner of the screen to the left of the application icon and then select the archive to open from the list. To add a new item in an archive, open this archive and then press the "+" icon to the top right of the screen. To modify an archive item, keep pressed the wanted item for a few of seconds and then select Modify from the contextual menu. To delete an archive item, keep pressed the wanted item for a few of seconds and then select Delete from the contextual menu. To add a new account, open the Navigation Drawer by clicking the top left corner of the screen to the left of the application icon. Select the Accounts icon and then press the "+" icon on the top right of the screen. Give a description, the initial amount and press the OK button. The categories allow the user to define several types of money movement. For example it is possible to define some kinds of expenses basing of the user needs like food, transport, clothing, and so on. It can define different types of accreditations like the salary and many kind of transfer entry. A transfer entry is, for example, when the user picks money with the ATM and transfer it in the wallet. In other words, moving the money from an account to another one. To add new categories, open the Navigation Drawer, select the Categories item and the press the "+" icon on the top right of screen. The movements archive serves to collect all the passages of money from and to the accounts. It registers every expense, every accreditation and every transfer entry. 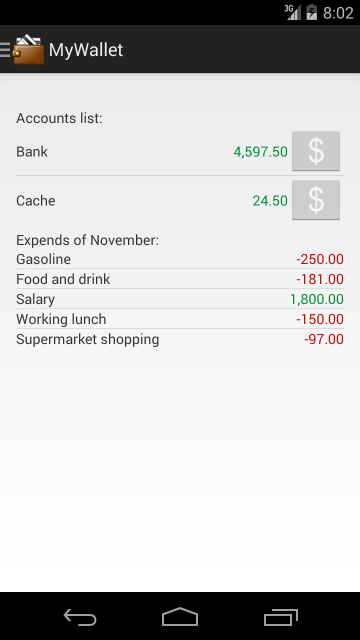 In the main screen of the application, there is the list of the defined accounts with the current money disponibility and the summary of the movements of the current month grouped by category. To the right of each account after the total disponibility there is a "$" button. Pressing this button it is possible to quickly add a new expense for the corresponding account.